Edamame Rice combines two simple dishes into a fun and delicious side dish that will pair perfectly with your favorite Asian main entree. Look for shelled edamame beans instead of edamame pods. Bring salted water to a boil in a saucepan. Add rice and 1/4 tsp. salt; simmer, covered, over low heat until water is absorbed, 15–20 minutes. Fluff rice with a fork. Combine vinegar, sugar, and 1/4 tsp. salt in a bowl, stirring until sugar is dissolved. Drizzle hot rice with the syrup, tossing so it absorbs into the grains. 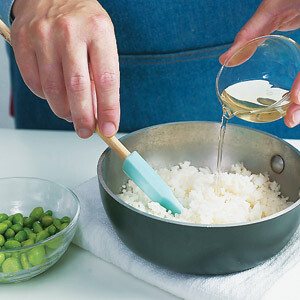 Stir in edamame; cover and keep rice warm. Serve rice with Teriyaki Chicken.